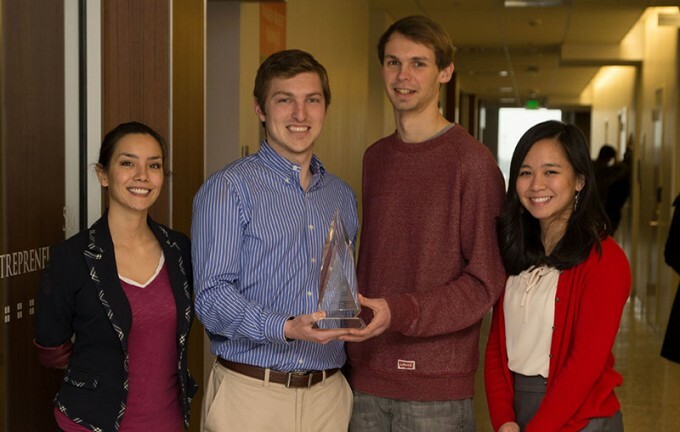 Bauer students (from left) Cassandra Hoang, Casey McNeil, Bobby Jacobs and Susan Tran from the college’s Wolff Center for Entrepreneurship won grand prize at the Baylor New Venture Competition. EDITOR’S NOTE: This is the first in a series of stories highlighting the success of student business plan teams from the Bauer College’s Wolff Center for Entrepreneurship in Spring 2014. Each year, WCE students work with the university’s Division of Research to develop commercialization plans for technologies developed at the university. Over the past 12 years, Bauer teams have had 21 podium finishes in national business plan competitions. Four undergraduate students from the C. T. Bauer College of Business at the University of Houston bested teams from across the U.S. that included MBA and Ph.D. participants to take the grand prize at the Baylor New Venture Competition in March. The team, all students in the college’s Wolff Center for Entrepreneurship, included Cassandra Hoang, Bobby Jacobs, Casey McNeil and Susan Tran. Their business plan focused on a technology developed by Allan Jacobson, the Robert A. Welch Chair of Science and Director of the Texas Center for Superconductivity at UH, that addresses rare earth elements (REE) used in computer memory, rechargeable batteries, cell phones, catalytic converters, fluorescent lighting and more. The REEcycle plan, as it is known, is part of a program adopted this year to have Bauer students create business plans around technologies provided by the university’s Division of Research. REEcycle focuses on recycling rare earth elements, Neodymium and Dysprosium, using a revolutionary process created by Dr. Jacobson to extract these elements from disposed electronic waste, creating a sustainable domestic supply of these critical elements. The demand for these elements is outpacing supply with the U.S. reliant on China to produce Neodymium and Dysprosium, which power our phones, electric cars and wind turbines. The competition consisted of a two-day event where the students participated in a feedback round allowing them to tweak their pitch for the semi-final and final competition the next day. Using the skills learned at the Bauer College, Jacobs knew they were poised for success. In the past 12 years, Bauer students from the Wolff Center have had 21 podium finishes in national business plan competitions.